Enjoying the boardwalk trail at Sheldon Lake State Park. There’s big push to get children outdoors. But kids aren’t the only ones who benefit from fresh air and sunshine. 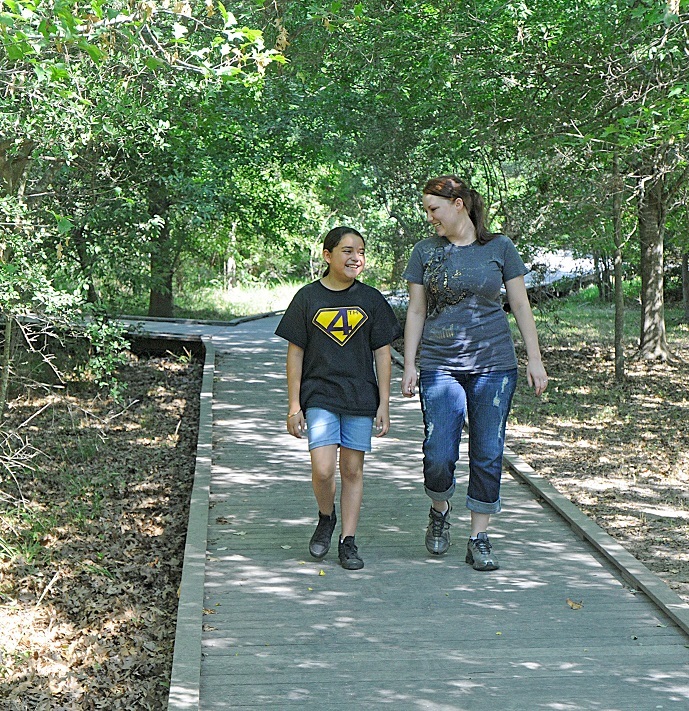 Survey says: Adults of all ages—as well as the kiddos—can achieve a better quality of life by committing to spending time in the wide open spaces…as well as the forested spaces…or watery spaces… Education and outreach director, Nancy Herron, shares some thoughts. When you spend time outdoors you can be healthier, happier and smarter. Those are some big claims there, Nancy. What do we mean by that? Actually there is a lot of research that’s out there that shows that people of all ages actually do have benefits from being outside in nature, and that does include improvements to your health, your stress level, your sense of self esteem and confidence. Even being more cooperative. Can you believe that? Communities are more cooperative; families bond better in the out of doors. These are interesting things that we now know that we took for granted, and we just didn’t realize. That there’s a whole bevy of benefits from being outdoors. Get healthier… happier…and smarter in the New Year when you spend time outdoors. Because, Life’s Better Outside…and so are you. Happy New Year from Texas Parks and Wildlife and all of us at Passport to Texas …I’m Cecilia Nasti. This entry was posted on Tuesday, December 29th, 2015 at 12:00 am	and is filed under Children in Nature. You can follow any responses to this entry through the RSS 2.0 feed. You can leave a response, or trackback from your own site.